eBooks are not only the best platforms to keep yourself engaged digitally, but are also one of the best ways to pass on your content to a larger audience base. In today’s competitive world, it becomes imperative for the book authors or content marketers to create an eBook that appeals to the readers. While providing a free eBook of your content will help create a prospect list of clients, an elaborately prepared eBook in the meantime will also convince your customers of your prowess, knowledge and resources. Why Do You Need to Create an eBook? The eBook is available to download and read right away keeping it fresh in their minds rather than waiting for the physical edition to be released. It even saves the substantial time of the reader to go to the bookstore, buy it and then read. Unlike paperbacks, eBooks allow you to search the exact text or content, facilitates you with the ease to read your favorite books on the go and even make them exciting to read with add-ons like hyperlinks, audio, and visuals. In addition to helping you turn you into the authority of your content; it also helps magnify your brand’s exposure by reaching out to a wider base of readers who get to know about your eBook either during an online search, through book reviews, or by simply hearing through the grapevine. The entire process of creating an eBook, assembling and distributing takes much lesser time than producing and distributing a paperback which eventually leads to greater profits. The simplest way to create an eBook is to export your file to Google Docs and then download it in epub format as shown below. You can also download Writer2pub plugin and use it with OpenOffice or LibreOffice to create ebook easily. 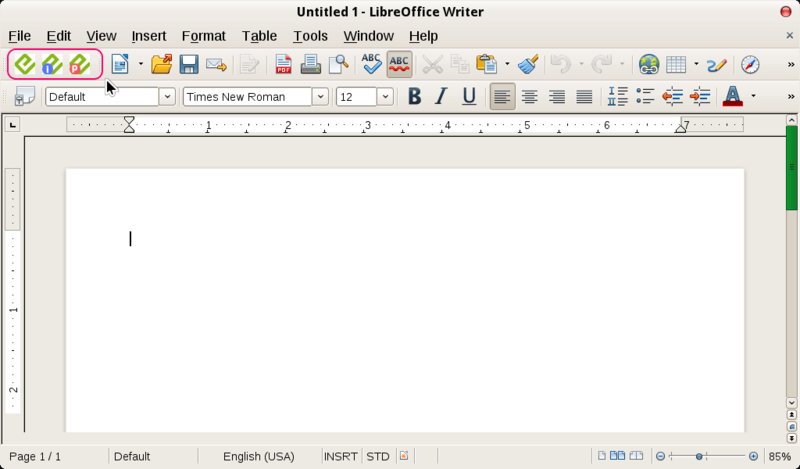 For this, you have to first install Openoffice or Libreoffice in your PC. Both are Pretty cool free and open source MS word alternative. There are also other numerous eBook creator tools available online that aid you to construct professional eBooks efficiently. While you can also create eBooks from pdf formats, HTML files, images, Microsoft Word or Scanned Pages, designing eBooks using eBook creator software is the easiest method recommended. You can convert different document formats with the help of eBook creator software such as, HTML, PDF, DOCX, ePUB, etc. to MOBI, ePUB, PRC, PDF and more. A few of them even allows you to add Cover photos, author details, symbols, content table and more. In this post today we have listed some of the best free eBook creator software for Windows that are widely popular based on their features and the ease of use. Apart from the common formats these eBook creators also support other file formats as well and can be accessed on different reading devices like, iPad, PC, Mac, iPod, Kindle, Android etc. So let us explore the best of the free eBook creator software. Calibre is a multi-platform free eBook creator which comes packed with all the necessary and cutting-edge features that can help you to build your personal eBook with ease. It helps an individual convert from an extensive range of file formats to an equally wide range of output formats. It supports input file formats like, DOCX, PDF, PRC, HTML, EPUB, PML, AZW, CBZ, AZW3, CBC, and many more which can be converted to output document formats like, MOBI, ZIP, DOCX, HTMLZ, AZW3, TXT, PDF and to a host of other formats. It allows you to change edit any of your earlier eBook that has been printed or downloaded by adding author description, illustration, cover images and more. 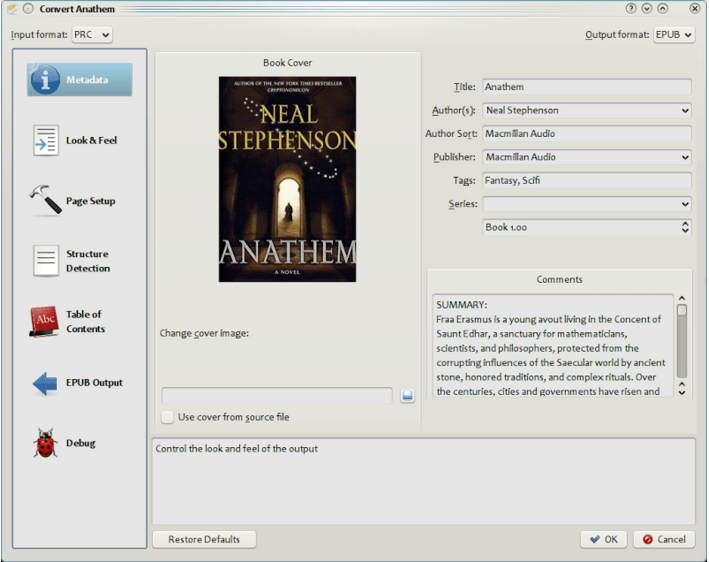 In order to create an eBook go to the option that says “Add Books” and choose the input file format on your computer. Now add meta-description such as, author bio, illustration etc. or edit option to your digital book. While you can add a customizable cover image to your eBook using the built-in eBook cover creator, you can also add content table, word search, word replacement option and change the look of your eBook. Now that you have successfully converted your eBook to the desired format, you can save it on your computer or you can transfer it to straight to any of the eBook readers that are connected to your computer. 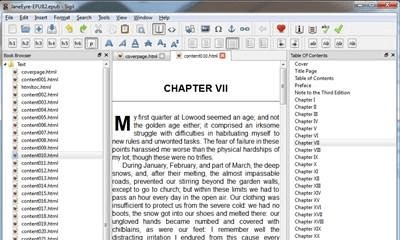 Calibre also helps you download eBooks, edit them and even lets you manage. Since it already has its own independent eBook reading software you do not need to download a separate one. It offers almost everything under the sun that you need to create your own professional looking eBook. Calibre is compatible with Windows, iOS and Linux. If you need an all-round performance for free, Mobipocket is just the right bet for you. It offers an extremely user friendly interface which is easy to comprehend too. The program allows you to either bring in already written matter or create an eBook anew. 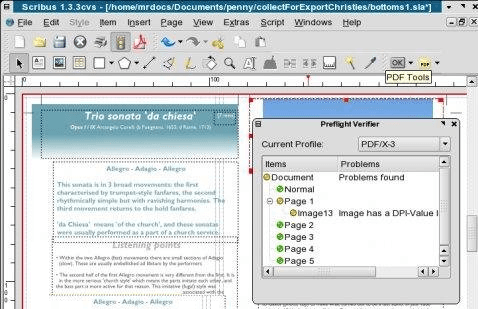 It acknowledges DOCX, PDF, TXT and HTM as input file formats. After you have imported all the existing content you can then add content tables, cover photos, meta-description etc. to your eBook. You can also modify the meta-description section by adding author bio, illustration, a title for the eBook, date of publishing, publisher name and more. To begin your eBook’s conversion process go to the “Build” option placed on the top of the program, click on the button and there you go. Your eBook will be converted to file extensions PRC or PRCX. Your eBook can also be published straightaway from the application or helps administer your online issue. 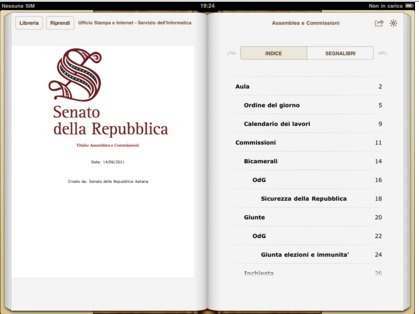 Mobipocket also works as an outstanding editor for your eBook. Overall it is a fantastic software for creating eBooks with additional offerings like, integrated templates, photo gallery, dictionary, date book, index, quests and more. As the name suggests MS Word to EPUB Converter is a tool that helps alter MS Word documents to ePUB for free. It offers an interface that looks clear and is easy to use and comprehend. Once you have finished writing in MS Word, you can then simply convert it to the ePUB extension. You will have quick access to this within minutes of the conversion. It supports input file formats that is .DOC or .DOCX of MS Word which can be altered to ePUB extension. Since this program only converts from an MS Word file, it offers restricted features. 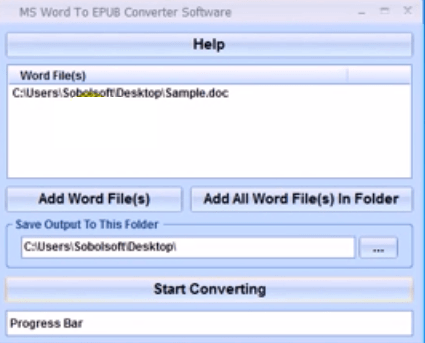 In order to start the conversion process you need to go to the option that says “Add Word File/Files” and choose the desired MS Word file from your computer and then select the preferred destination/folder where you want to save your eBook. Now initiate the process of conversion of the document and get it in the ePUB extension within minutes. You can keep an eye on the progress bar to see when the conversion is over. You can alter an MS Word file without any restriction even on the demo version; however, it does not allow you to add all the MS Word documents together in the conversion string. Considering that it is the elemental version of MS Word to EPUB Converter, it does not offer much functionality. It is quite close to the default add-ons of the MS Word which can be downloaded to do something similar to what can be done with the “Save As” option. Helpful for both beginners and experts, Sigil is a great free eBook creator software that will help create your own eBook effortlessly and in no time. It also offers code view along with the regular view and WYSIWYG to fit other skill levels. Sigil boasts of a wide range of useful functionalities like, spell checking, content table creator and book browser. Using Sigil you can alter file extensions like ePUB and HTML to only ePUB. While it allows you to make use of add-on features like adding visuals, audios or photos in your digital book, you can also modify words with the help of hyperlinks, tables, superscripts, lists, etc. Sigil is compatible with and can be read on operating systems like, Mac, Android, Windows and iOS. Quick Publish – choosing this option will simply add your documents to the ePUB format without the requirement of adding any additional information to your eBook. Publish – choosing this option will ask you to insert a cover photo for your eBook (add eBook cover) and add meta data like author bio, illustration, eBook title, characters and more before you proceed to alter your Word file to ePUB version. Save as PDF – choosing this option will allow you to convert your Word file to PDF format. 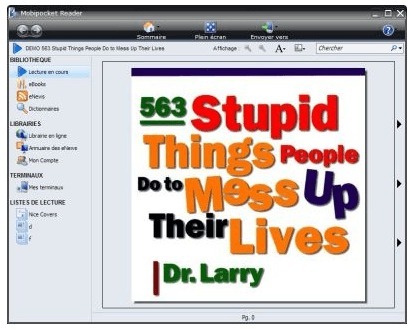 Scribus is an open source eBook creator software that is a powerful tool for desktop publishing. On some occasions, you just need a state-of-the-art designing tool that can transform your otherwise mundane project into a competent one and that’s when Scribus helps you to impart that much needed professional look to your eBook. This program is licensed as a free tool and is a great and compelling alternative for all the expensive software available out there. It is extremely competitive even to the high-end and pricey eBook creator tools online. However, Scribus is a program that is not easy to comprehend at one go hence, you need to understand it first and get used to it which takes some time. Once you get a hold of its concepts you will then be able to create brilliant designs for your tabloid or news daily. It is constituted of the free Q equipment with its original editions available operating systems like, OS-X, Windows, Mac, Unix/Linux based, Haiku and others. Scribus also helps you to build advanced files that are fit for professional publishing or you can simply save them in PDF versions for online distribution. You can also make animated versions of PDF files as well as interactive versions. It is an extremely small software that helps you to create exceptional eBooks in no time. It occupies your PC space of only 1.8MB and works with Windows 98, Windows XP, Windows 7 and Linux (32& 64 bit architecture) . 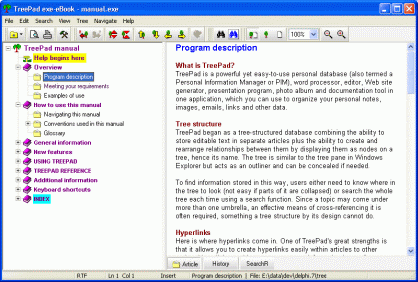 Exe-eBook Creator that is offered by Treepad is available for download and use absolutely free of cost and can be utilized to create executable files of the TreePad Docs that run on their own. The Exe-eBook creator offers help for TreePad files that are password locked and encoded. The photos that you place on the input documents can be in the usual file extensions such as, GIF, PNG, CO, JPEG, etc. it also adds a shell context list for the hyperlinks on the document, open the images easily, modify and print them. The output files come with additional features like zoom, search option, and activity history. You can also get a print out of the TreePad files and even edit the design. You do not need to install the Ex-eBook Creator and rather download it right away from a portable device with no effect on the system registry. SCRIBA eBook Maker is a tool that assists you with creating eBooks in PDF, ePUB or zip extensions with the help of contents that already present in other extensions like, PDF, HTML, etc. This can be performed both on the file systems and online. SCRIBA is a JAVA based software that consists of a command line interface. This program can also be used like a “Plugin” and hence, can be utilized to pre-develop content before they are added to the eBook. So to use SCRIBA you simply need to assemble a labeled XML document that consists of indications/URLs to the write-up of the eBook under creation. These are the 10 best free eBook creator software for Windows available among the others in the category. Do let us know your views if we have missed out on something that you have used and liked. Hi – have you tried Book Creator for Windows?